Don’t believe the hype. No really, forget what you’ve heard about this so called romantic city. Sure, the romance’s there alright, for a hefty price. Venice is actually a tourist trap, sucking in millions of tourists a year who all fall for the same thing; that one image. That image of canals filled with gondolas. That one image of singing gondoliers with their opera worthy voices. What an image. It’s a trap easy to walk into. As easy as a venetian canal when you’ve had too much wine. Stumble, fall, splash. Welcome to Venice. I wonder how many people actually do take an accidental plunge in the water each day. It’s a number I’d love to know. A number that would be higher if I had no self restraint. More than once did I want to push someone into the tiny canals and the not entirely clean water. I think Venetians want to do the same (to me, I guess); plenty of anti-tourist graffiti on the walls chanting catchy phrases such as “die tourist die.” Oh Venice, you sweet talker. A great deal of day time in Venice I had to suffocate in the herds of mass tourism ( They’re moving in herds… they do move in herds), walking elbow to elbow with people I don’t know, people who were clearly enjoying themselves more than I was. The nights I spent in an hotel, listening to the buzzing and whining of dozens of mosquitoes whom I had to share a room with and the adventures of my neighbors, also clearly enjoying themselves more than I was. Reading all this you’ll be forgiven for thinking I hated my stay in the city, but I didn’t. In fact, I thoroughly enjoyed my stay in this labyrinth of alleys and canals, because Venice has something special, a feeling, an atmosphere that’s hard to describe, but easy to get lost in. Getting lost is the key to truly experiencing this city. Take a few turns and you’re away from the stampeding crowds and you’ll find yourself alone in a small alley, surrounded by picturesque houses rising high above you. It’s where the sound of marching masses fade out and the echoes of your footsteps take it’s place, as you wonder where on earth you are (Hint: it’s Venice). If you find yourself restless in the bed of your hotel, go back outside; that wonderful image of Venice you have in your mind? It’s there, when the sun has set the and lights of lanterns reflect in the water, when everything and everyone settles down, preferably at a good restaurant or wine bar. Should you find yourself alone and without a map, uncertain on where to go, take a deep breath and enjoy yourself, your experiencing Venice at its, dare I say it, finest. If you’re smart, you’ll get lost during the magic hour; the hour when the sun has barely come up and only a handful of locals are up, getting ready to go to work while the rest of the city still slumbers after a night of drinking (too) expensive wine. Venice is gorgeous when it appears deserted. If you like to snap pictures, this would also be the perfect time to take all those photos you want without having to struggle against dozens of people trying to do the same thing at the same spot. Enjoying Venice means getting lost in the streets or finding another means of escaping the chaos of daytime. Visit a few museums, churches, set up camp on a square or a flight of stairs and observe all things passing by. There’s plenty of other things to enjoy in the city beside architecture; some of the museums are lovely or at least amusing. Be warned about the Gallerie dell’Accademia though; to me it was a big disappointment. Beautiful artwork, yes, but most of it looked alike and, in my humble and barbaric opinion, boring, uninspired and unimaginative. Me: 1 – Admired artists: 0. At least it was quiet in there and the temperature pleasant. The DaVinci exhibit that happened to be around when I was there, was great. I’m not sure how often there is one, but it should be. Cheap and good, a perfect combination. If you enjoy operas and classical music, than congratulations, you’re in the right place. You’re never too far away from something like an opera house and there are plenty of musicians on the streets. Some better than others. When possible, be sure to pay a visit to Interpretti Venezano. This small orchestra plays Vivaldi and does so excellently. Though food in Venice doesn’t have the same quality as the rest of Italy (apparently a Venetian pizza does not live up to the Italian reputation), it’s still good. Especially in the smaller restaurants and bars. The wine and the coffee (especially the coffee) are a blessing for the tongue. If you’re short on cash or just looking for something simple, there are plenty of food vendors (including pizza vendors) that offer things for a low price. Indeed, these vendors do not always offer the best, but they offer a lot for little, making them an excellent source of nutrition for travelers on a low budget. 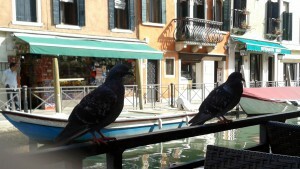 Should you decide to visit Venice, be sure to stay in a hotel in the city. If you still intend to stay in a hotel on the mainland, make sure it’s an hotel close to one of the bus stops of Line 5, that runs between the airport and the city. A ticket is only a few euros and often you can take it for free (bus driver’s mood and willingness to check for tickets is an important factor, I assume). Don’t take a boat to Venice though, the water taxis are overpriced (more so when you take one from the airport), take a water bus (vaporetto) to get around if needed. Staying in the city is more expensive, but it means you can enjoy all of it without having to waste your time traveling back and forth all the time. Venice is a one of a kind place, not because of it’s canals (plenty of those to see in Amsterdam for instance) but because of it’s peculiar ambiance and atmosphere, an architectural wonder with its gorgeous structures, churches, palaces, its delightful little streets and cute little bridges. Walk around and stare in wonder. The people who built this place knew what they were doing. But it’s also a city that seems to have lost some of its authenticity as it got caught in a ballroom dance between art and kitsch, romances of old and modern needs. But if you remove it’s ballroom mask and take it for what it is, if you’re willing to get lost in all it has to offer, it’s a city worth visiting.